"In the interview with Sam, she talked about the experiences she’s had as the child of immigrants from the Dominican Republic and self-identifying as Dominican-American. As the interview progressed, the topic of family became more prevalent and Sam focused in on the contrasts between her life at home, where they watch Spanish-language television and her parents work long days and her experiences at college. She talked about the beauty standards of Dominican womanhood, and her relationship with her mother. The difference in her appearance from her time at Skidmore and her time spent at home was a significant piece of her identity. With one foot in the cultural belly of Skidmore and her college-experience, and another foot in her Brooklyn, Spanish dominant home, Sam speaks to cultural boundaries and what it is like to be standing over one. 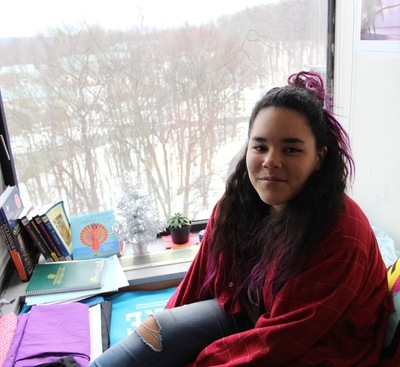 “Interview with Samantha Garcia,” Skidmore Saratoga Memory Project, accessed April 24, 2019, http://ssmp.skidmore.edu/document/605.